It is believed Eton formed a branch of the Temperance Guild in 1878 and Eton Wick about 6 - 8 years later. The following are a few extracts taken from the Parish Magazines of 1884 to 1904, with particular regard to the vices of drink, cigarettes and gambling. Two months later a Parish Magazine report (Eton) "Rev Donaldson of Maidenhead gave a talk to the Temperance Society on the evils of grocers selling spirits. It was resolved to petition Parliament. The subject of Sunday closing of public houses was also debated." Parish Magazine 1888 - "At the last meeting of the Eton Temperance Society interesting information about the licensing claims of the Local Government Bill was given by Mr Stephen Bourne. The C.E.T.S. (presumably the Church of England Temperance Society) recommends these clauses generally, but urges petitioning in favour of some amendments. It would place some limitations on the time allowed for compensation. Steps have been taken by the Society toward securing allotments for working men. The ground proposed is just opposite the Sanatorium (Eton Wick Road). We hope before many weeks to have three acres under cultivation in this way. Applications for holdings must be made at once." Parish Magazine February 1888 - (Eton and Eton Wick) "During the week commencing 13/2/88 the powerful Temperance missionary known as the 'Paddington Dustman' will speak in different parts of the Parish daily, and we trust his efforts to reclaim those who are enslaved by drinking habits will be abundantly blessed, and that many may be helped to begin a Christian life in real earnest. The C.E.T.S. Benefit Society is doing well. At the close of 1887 each member received £1.1s.7½d (£1.08p) back from his payment of £1.3s (£1.15p). By the rules of members, they contribute 6d (2½ p) a week and are entitled to 10 shilling (50p) a week during sickness, up to three months and to 5 shilling (25p) a week for the following three months." In August of that year, the Parish Magazine wrote: "Let me say a word or two to the fathers and mothers who send their little ones with a jug or a bottle to the public house to fetch them beer. When you do this, you forget you are doing a great harm. Some children have very inquisitive minds and will have a look inside to see the colour and then perhaps taste it to see if it is nice; on the sly; and you forget you are undoing six days in the week, what the friends in the 'Band of Hope' for an hour or so on one night a week are trying to instil into your little ones. Do you not think that if anyone ought to care for your children and to see they are kept out of danger, you yourself ought to do so." In April of 1888 the same magazine reported "The Temperance Society (Eton) held on Easter Tuesday a tea. During the tea, they were regaled with music from the 'Guards Pipers'. At 8pm a grand meeting was held in the upper school (College). The Bishop of London made a speech. Members of the Parochial Branch, including the Children's Guilds, numbered 500. During the summer meetings will be held fortnightly. Twice during the last fortnight our special preachers have called attention to the prevalence of gambling. It is an evil attracting much attention and calls for special warnings at this time. A preacher said "Young men, the vice from my experience and from testimony of others is devastating your lives at least as seriously as drink is gambling. Covetousness is the idolatry of this age. Gambling, you forget that you are the holders of what God gives you for his glory. You forget that you are trying to get money without fulfilling the dignified condition of work. You forget that your success, if it goes to anything, at least like large dimensions means another's misery. You become victims not only of the idolatry of covetousness, but of the intoxication of chance. Young men! I have seen ruined homes, ruined lives and ruined loves. Come away from this increasing and debasing vice. For God's sake gamble no more." June 1888 Parish Magazine - Children of the Eton Temperance Guild will have their summer tea on July 31st at the school (Porny). After tea, weather permitting, all will adjourn to the Vicar's lawn for entertainment prepared by Rev'd A Treherne and Miss Wilkinson, starting at 7.30pm. Members of the Church of England Temperance Society being admitted free. On July 17th the Annual Fete of C.E.T.S. will take place in Mr Everards' grounds. February 1904 Parish Magazine - A report of the Eton Wick Temperance Juniors Society since Christmas 1903. "Among many advantages of membership are that all regular members are paid ½ pence (1/5 of present pence) per attendance. The fourteen Lieutenants each receive 1d, the seven Captains 1½d; and the Colonel 2½d (per meeting) the General 3d". (On Smoking) "It is a great pity that the boys of England should undermine their constitutions and spoil their powers of usefulness by this poisonous form of entertainment (Boys Smoking) The law will probably step in to prevent the sale of this cheap rubbish to small boys…… etc; another danger lately is the poisonous nature of many of the vile concoctions sold as wholesome beer and spirits"..... etc. These extracts were taken from the Eton Parish Magazines of the late 19th to early 20th century. At that time Temperance Groups were increasingly vociferous, perhaps not without cause. The period coincided with the building of Boveney Newtown's Methodist Chapel in Alma Road and certainly, its creator, Annie Tough, would have worked hard for Temperance. 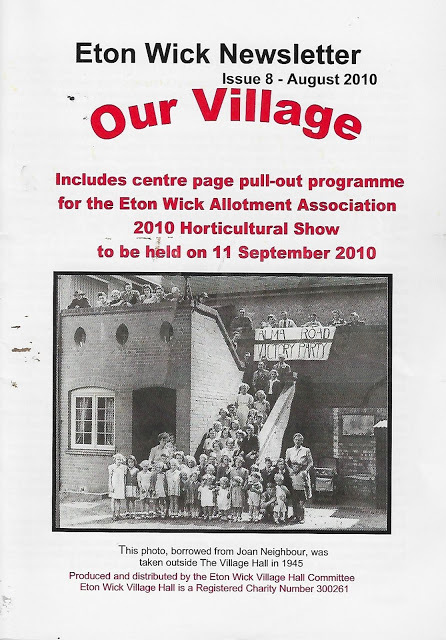 This article was first published in the Eton Wick News Letter - Our Village in August 2010.